To what should we compare human life? It should be compared to a wild goose trampling on the snow. the goose flies away no one knows where. The translation of the mid-Qing-dynasty Manchu Bannerman Lincing’s (Linqing 麟慶, 1791-1846) Tracks in the Snow 鴻雪因緣圖記 was undertaken by Yang Tsung-han 楊宗翰 at the suggestion of John Minford in the 1980s. Further work was done on these translations by Rachel May. Since 2015, Christina Sanderson has been collating and revising Professor Yang’s unfinished work and translating the remaining chapters of Tracks in the Snow. 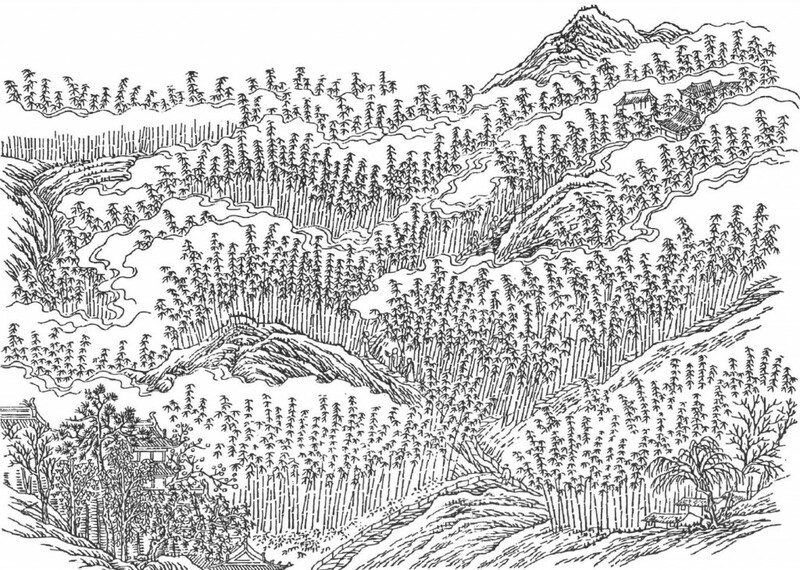 This translation with annotations and explication is being undertaken with the support of an Australian Research Council grant awarded to Geremie R. Barmé and John Minford under the title ‘Manchu Rivers, Manchu Mountains’. Links to previously published chapters from Lincing’s illustrated memoir are provided below. New work will appear as it becomes available. the full translation with illustrations will be published in book form. In 1989, the Hong Kong writer Xi Xi 西西 was diagnosed with breast cancer. Post-operative treatment damaged the nerves in her right hand, but she taught herself to write with her left and, in 1992, published Elegy for a Breast 哀悼乳房 (adapted for the screen as 2 Become 1). Later on, in an effort to regain movement in her affected hand, Xi Xi focussed on handicrafts. Over the years, she crafted dolls houses, puppets and stuffed animals, and eventually teddy bears. 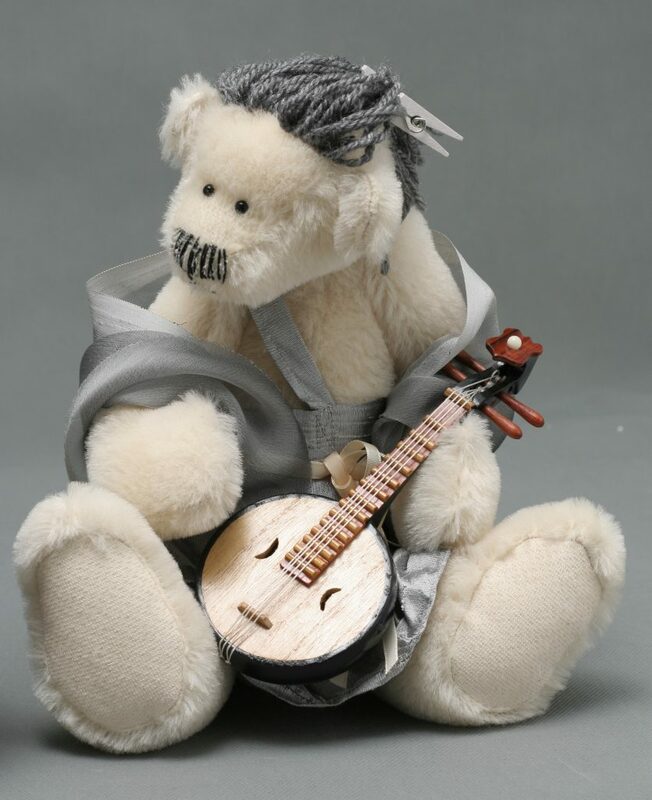 Her bears started out within the familiar tradition of the Western teddy — the toy bears inspired by Theodore (Teddy) Roosevelt in the 1900s and Winnie-the-Pooh in the 1920s — but over time Xi Xi developed her own, uniquely Chinese breed. The Teddy Bear Chronicles, a seal carved by He Fuxing 何福興. The Teddy Bear Chronicles 縫熊志 appeared through Joint Publishing HK in 2009. It consists of short essays influenced by the biographical style, or 列傳, of Sima Qian 司馬遷 (206 BC-220 CE), the Grand Historian of the Han dynasty. Xi Xi matches her biographical sketches with images from her ursine pantheon of handmade teddies. 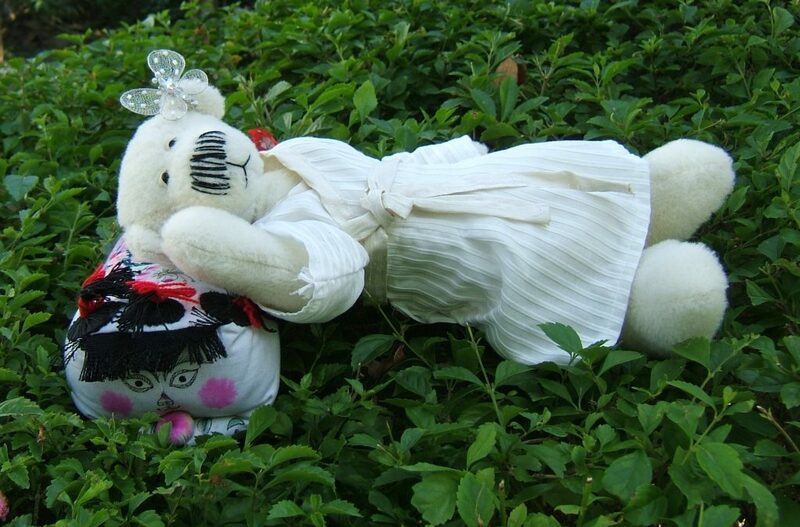 This Teddy Bear’s Picnic includes mythological figures such as the Queen Mother of the West 西天王母, as well as Hou Yi 后羿 and Chang’e 嫦娥, along with historical personalities like the Taoist thinker Zhuangzi 莊子, the disaffected courtier-turned-poet Qu Yuan 屈原, the historian Sima Qian himself, the calligrapher Wang Xizhi 王羲之, the recluse Tao Yuanming 陶淵明, as well as the mauruding emperor Genghis Khan 成吉思汗. Xi Xi also found inspiration in the heroes of the popular Ming-dynasty novel Water Margin 水滸傳. Some prominent figures from the West share the spotlight, too, including Julius Caesar and Cleopatra; there’s even a suave Lawrence of Arabia. All the teddies wear costumes designed and made by Xi Xi. Xi Xi is one of those rare artists who has the genius to make the old new again. It is a talent that she has nurtured in (and that thas been nurtured by) Hong Kong. The Teddy Bear Chronicles is an ecumenical fancy-dress ball; Xi Xi sent out all the invitations, she wrote the script and dressed the guests. It is with great pleasure that below we introduce our readers to ‘Zhuangzi’, a teddy bear tale inspired by the great philosopher who lived around the fourth century BCE, during the Warring States period. Xi Xi is the pen name of Cheung Yin 張彥, one of Hong Kong’s most beloved and acclaimed writers. She says that the Chinese characters of her pen name, 西西, look to her like a girl playing a Chinese form of hopscotch in a skirt. Her creative work is a delicate admix of the naïve and the absurd. Regarded as a pioneer of experimental filmmaking and screenwriting in the 1960s, Xi Xi went on to publish two collections of poetry, seven novels, twenty-one short story and essay collections and one stand-alone novella. Her essays have also frequently appeared in the popular press, as have her translations. 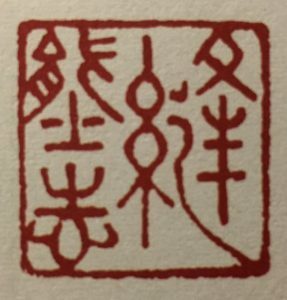 Xi Xi, a seal carved by He Fuxing. Xi Xi is the second of five children born in 1938 to Cantonese parents in Shanghai. The family migrated to Hong Kong in 1950 shortly after the founding of the People’s Republic on the mainland. Following high school and graduate education, she worked as an English teacher at a government primary school. Living in the cultural and trading entrepôt of Hong Kong and comfortable in several languages, Xi Xi was exposed to world literature and culture from an early age and she cites the main influences on her work as being children’s writing, film and Latin American and European literature. This introductory note is based on material provided by Christina Sanderson, translator of The Teddy Bear Chronicles. It also incorporates information from Jennifer Feeley’s introduction to Not Written Words 不是文字, a selection of Xi Xi’s poetry in translation. We are grateful to Christina for sharing this new work with our readers, and to John Minford who introduced us all to Xi Xi’s panoply of bears. The translation of The Teddy Bear Chronicles will appear as a volume in a series under John’s editorship. That series is generously funded by the Hong Kong Arts Development Council. The photographs of Xi Xi’s teddies are by Chan Kum-lok 陳錦樂 and Lum Kwok-wai 林國威. We look forward to introducing more teddy bears from Xi Xi’s chronicles in the future. Zhuangzi was a fascinating individual with more stories up his sleeve than anybody else in the world. Some of his stories are long, others are short; but they’re all interesting and superbly imaginative. They’re also full of paradoxes — to use a favourite expression of his (even though it’s become a terrible cliché). In one instance, a gigantic bird capable of flying ninety thousand li in one flap of the wing turns out to be the transformation of a miniscule fish. In another, a massive gourd that was hopeless as a water jug could well serve as a sailing boat. Then there’s that huge, useless tree, which delights in being considered useless. Since nobody wants it for anything, it can come to no harm. Why wouldn’t it be happy about that? Zhu Guangqian, who founded the study of aesthetics in modern China, wrote an essay discussing three ways to look at ancient pine trees. It’s interesting enough. But aeons before this, Zhuangzi had already introduced another, completely different point of view: that of the tree itself. Once we can imagine a tree with its own own point of view, then we won’t go around thinking ourselves better than trees, or imposing our will upon them. From then on, we will respect trees. Starting from a sense of respect for trees, we can go on to respect other things. 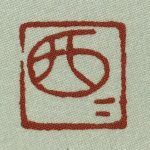 Zhuangzi is constantly teaching us how to see things differently: from the opposite angle; from the contrary point of view. The idea is to reveal how not to be stubborn, biased, or prejudiced. In one case, he asks: How can a summer-born bug whose life spans just a single season, ever hope to understand ice or snow? He goes on to explain why the summer bug has no way of understanding such things. It should be aware of its limitations, and accept the possibility of other points of view. It shouldn’t go around judging things related to other seasons from its own limited perspective, that of a summer bug. Humans perpetuate the error made by the summer-born bug, and have been doing so for more than two thousand years. They say that a certain monarch once offered Zhuangzi the post of Prime Minister. He refused. Now that is an earnest renouncement of fame and fortune. His stories were certainly not idle chit-chat. He practised what he preached. Zhuangzi dreaming of a butterfly, or a butterfly dreaming of a man called Zhuangzi. Source: The Teddy Bear Chronicles. Photograph by Chan Kum-lok 陳錦樂 and Lum Kwok-wai 林國威. Sometimes Zhuangzi himself becomes the protagonist of his stories. The most famous is about a dream he once dreamed. He dreams of a butterfly, then imagines himself as the butterfly; until he no longer knows whether he is Zhuangzi dreaming of a butterfly, or a butterfly dreaming of a man called Zhuangzi. It has to be the best dream in history. Since when did we stop having wonderful dreams like that? Since when did our dreams become nothing more than objects for psychopathology? The Zhuangzi bear I’ve made is most likely dreaming of butterflies in his sleep, too. You’ll see he has a wawa pillow, with a doll’s face at either end. Where is he sleeping? Under a big tree? On the grass? Just as a butterfly would, he has perched himself on top of a hedge for a nap. Here we introduce two more figures in The Teddy Bear Chronicles 縫熊誌, created by the Hong Kong writer and teddy bear artist Xi Xi 西西 and translated by Christina Sanderson. 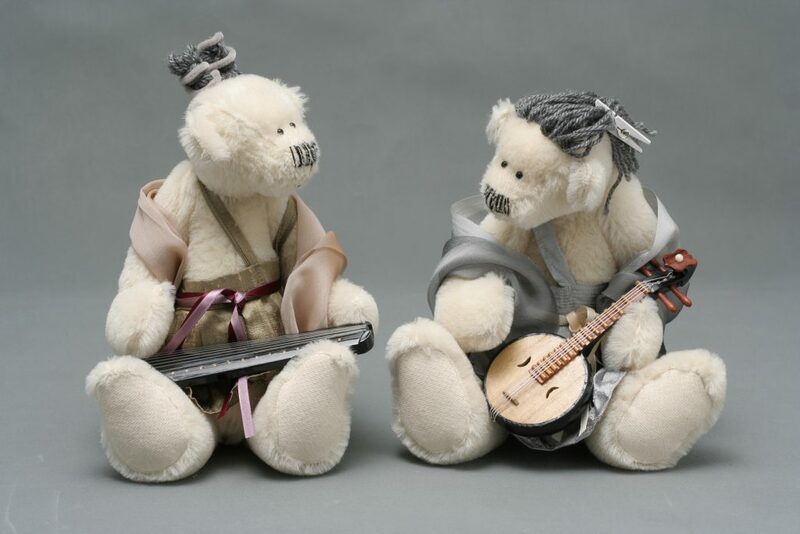 The teddies and essay below feature Xi Kang 嵇康 and Ruan Xian 阮咸, two of the famed Seven Sages of the Bamboo Grove 竹林七賢. This informal group of free-wheeling individuals flourished during the Wei-Jin period, that is, in the Fourth Century of the Common Era. That era is also a feature of our inaugural China Heritage Annual, which takes Nanking as its focus. Xi Kang is also one of the guiding spirits of China Heritage; his personality and words inspired On Heritage 遺, an essay that offers a Rationale for The Wairarapa Academy for New Sinology. One of our China Heritage projects is to introduce Xi Xi’s Chronicles in translation and we are grateful to Christina for continuing to share her work with our readers, and to John Minford who introduced us all to Xi Xi’s panoply of bears. The full translation of The Teddy Bear Chronicles will appear as a volume in a series under John’s editorship. That series is generously funded by the Hong Kong Arts Development Council. The Six Dynasties was a period of chaotic disunion when northern China was in the hands of non-Chinese leaders and the south was ruled by a succession of weak and short-lived dynasties. The work of poets and artists of this era reflects the unease and anxiety of Chinese society at the time. Many literati tried to escape the atmosphere of corruption and intrigue by moving away to the country, where they would indulge in drinking, music and poetry. Xi Kang, (aka Ji Kang 223-262) and Ruan Xian are two of a famous group of scholars, writers and musicians said to have done just this, known as the Seven Sages of the Bamboo Grove. They are alleged to have gathered in a bamboo grove near the house of Xi Kang in Shanyang (in present-day Henan province) where they celebrated the simple, spontaneous things in life. Although Xi Kang married into the Imperial family, and received an offiical appointment, his favourite study remained that of alchemy and forging iron (apparently, ‘to imitate the activity of the Tao, the Great Smith’). Happening to offend one of the Imperial princes, who was also a student of alchemy, he was denounced as a dangerous person and a traitor and condemned to death. Three thousand disciples offered themseleves in his place, to no avail. He met his fate with fortitude, calmly watching the shadows thrown by the sun and playing upon his zither. Xi Kang and Ruan Xian by Xi Xi. 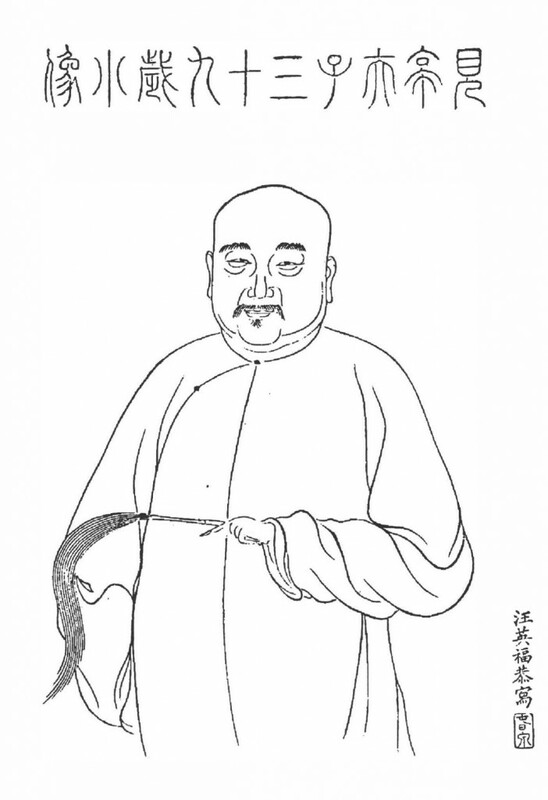 Ruan Xian by Xi Xi. Gentlemen in Retirement 高逸圖, by Sun Li 孫立.